Description: Transparent free blown blue-green jug with round body, bulging bottom with barely perceptible pontil mark. The walls first widening towards the top and then again light raids. The upwards slightly flared neck lies deepened and is further around finished. From the shoulder is an ornate handle with three ribs. First tilted up, horizontally, and then with a double loop (if a thumb rest) on top and against the edge and neck attached. Remarks: A jug as this has almost certainly been used when serving of water or wine during the meal (cena) in the dining (triclinium). Along with cups and bowls, the last filled with poultry, vegetables and fruit. References: Musée du Louvre, nr.553; Verres Antiques et de l’Islam, Collection de Monsieur D. (Loudmer/Kevorkian 1985, nr.477). Description: Pale blue glass, bell-shaped bodies, cylindrical neck encircled with respectively eleven and twelve revolutions of turquoise glass thread. A revolution of thick glass thread just below the rim. The rim, kicked off and polished, the angular turquoise glass handles applied to the shoulder, drawn up and attached to the top of the neck. Base indented, rest of pontil mark. 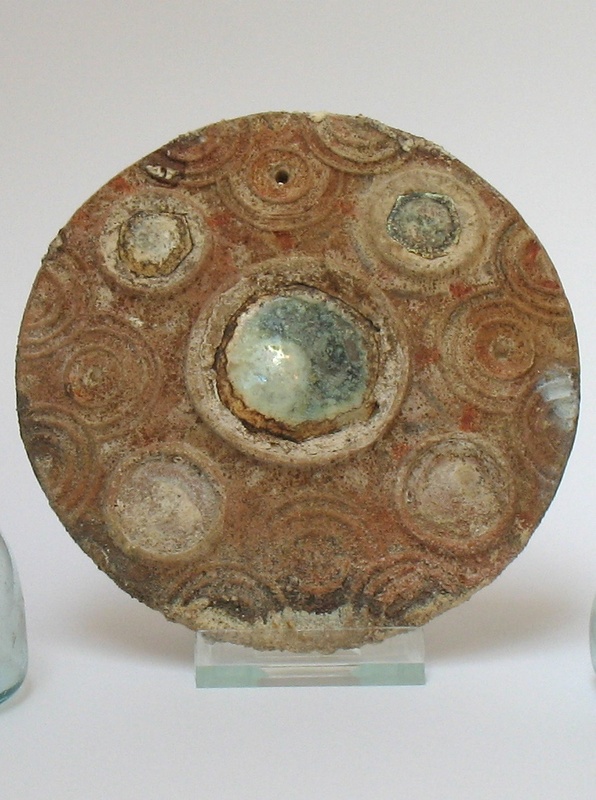 Description: Molded, white plaster disk, then painted; three iridescent glass fragments embedded into circular cavity. One big piece in the center and across the disk four others, two missing. The disk itself decorated with a series of twelve geometric designs of three circles each. The disk is pierced for hanging. Remarks: Cast plasters mirrors with glass fragments date from the fifth to six century. Apotropaic refers to objects such as amulets and talismans or other symbols like mirrors were apparently placed into graves in order to ward off evil spirits (Bianchi 2002) This apotropaic mirror was found in a tomb, together with the two small jugs. Rare. Remarks:This spherical flask was blown from colorless glass. Around the body are several wheel-cut bands. The long tubular neck ends with a collared rim. The piece is intact and has a beautiful bluish green iridescence. Desciption: Transparent cobalt blue glass. Pear-shaped body. Cylindrical neck with constriction at bottom. Rim folded outward, upward and inward. Flat base. No pontil mark. Condition: Intact with inside some rests of earth. Remarks: By the rests of earth inside you can see that the unguentarium was horizontally in the ground. Reference: Roman and Pre-Roman Glass in the Royal Ontario Museum (Hayes, 1975), no. 107; Roman Glass in the Corning Museum of Glass – Vol. I (Whitehouse, 1977), no. 247; Vetri Antichi del Museo Archeologico di Udine (Buora, 2004), no. 180; Ancient Glass and some Egyptian Antiquities – Dos and Bertie Winkel Collection (van Rossum, 2014), no. DOS18. Remarks: A pale-green twin handled jar has a depressed globular form with indented base and wide flaring neck. The body and neck are decorated with a continuous spiral thread. The jar is almost clear and is in excellent condition. Remarks: This aubergine glass pitcher has an ovoid blown body with an applied trail decoration and handle of light green glass. 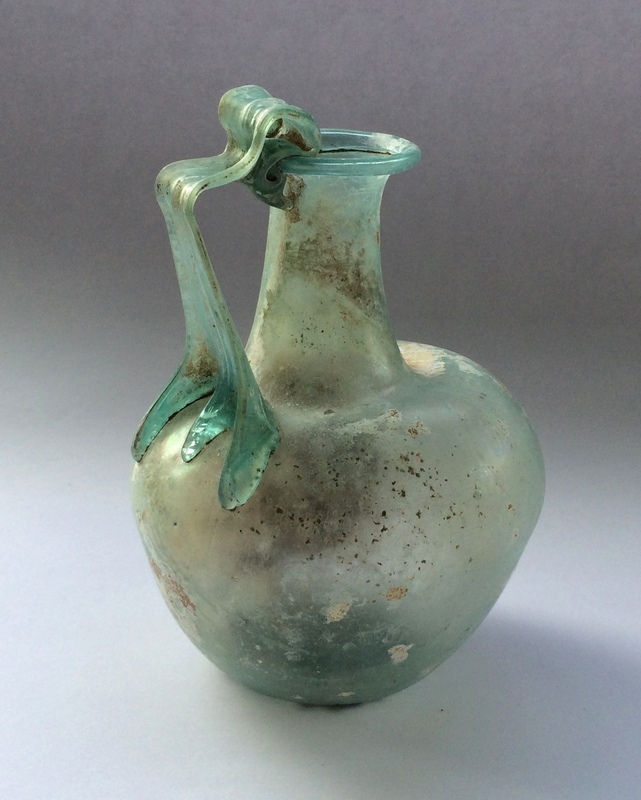 The excellent state of preservation makes this elegant jug an extraordinary work of the late Roman glass industry. Remards: This is a light violet mold-blown bottle with a single light green handle which was probably made in Sidon. Sidon is located in the modern country of Lebanon and has been a glass manufacturing center from the time it was a Phoenician city about 4000 BC. It may be the city where glass was first made. During the Roman period Sidon also continued to be a glass manufacturing center. 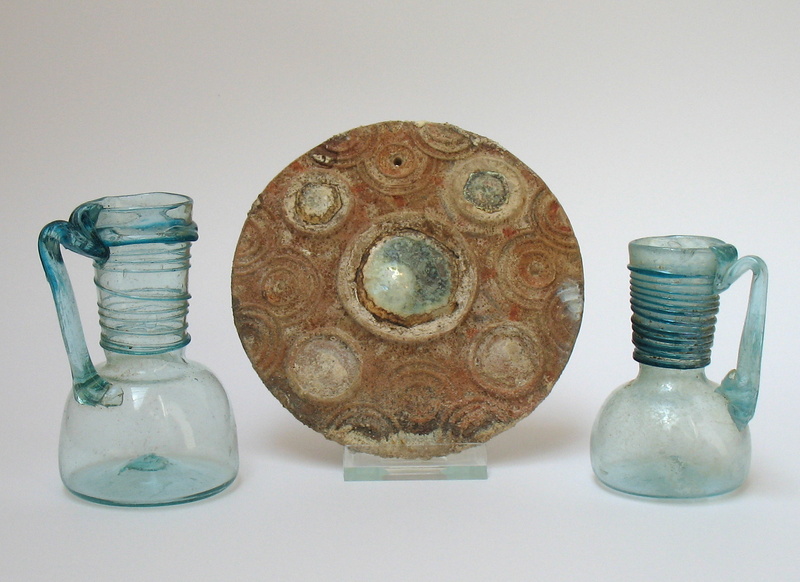 A large group of these small mold-blown bottles of this type are thought to come from this area and were made in the first Century. 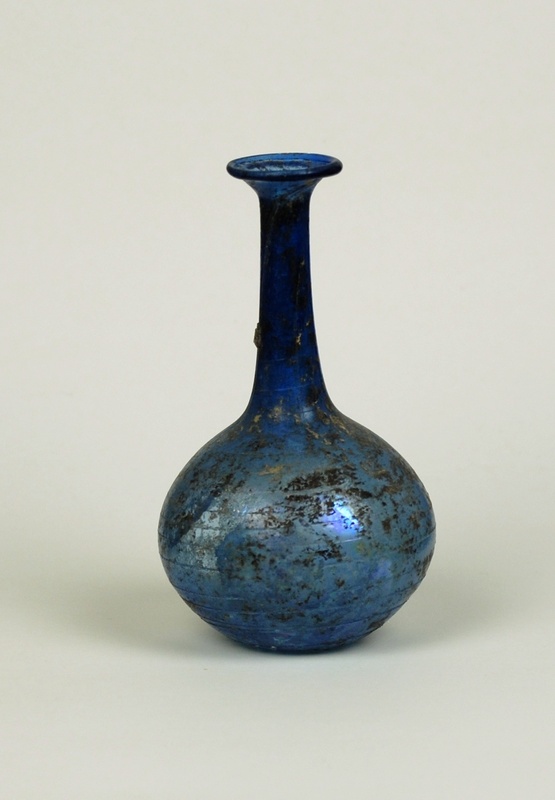 Sidonian bottles were made in many different motifs and colors but are all in the general size and shape of this example. 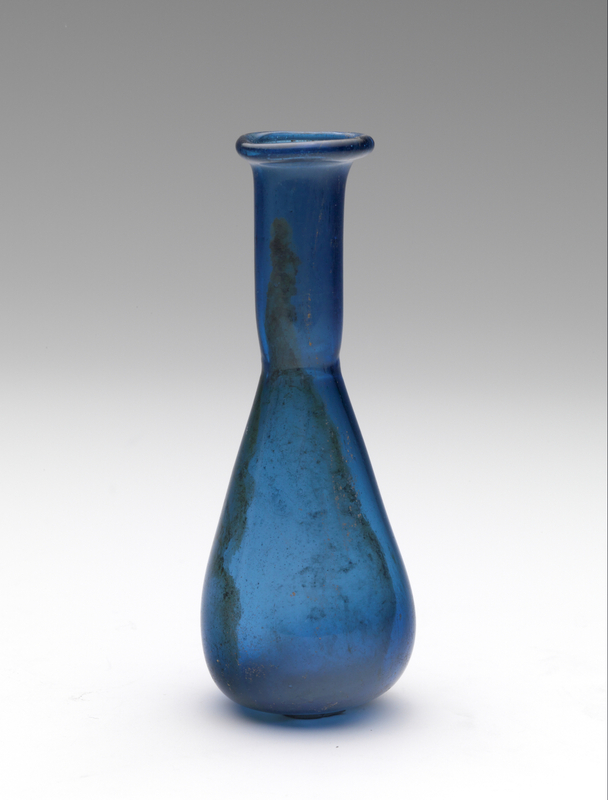 This deep blue Roman bottle is decorated with a thin colorless glass trail spiraling around the body and onto the base. Bottle has been repaired using original pieces. 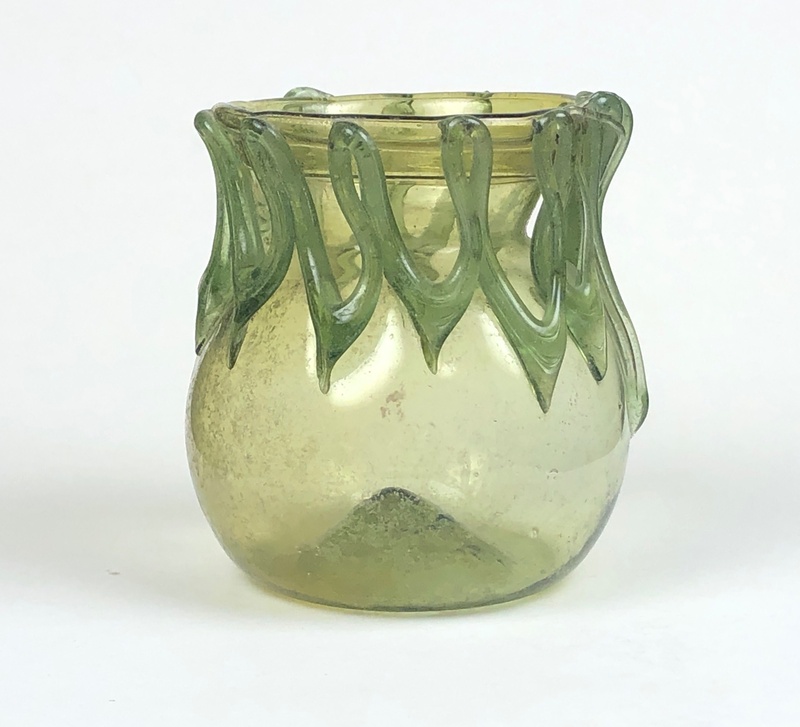 This is a Roman glass jar with zig-zag trailing between the top of the rim to the shoulder of the body. It was probably made in the eastern Mediterranean area. From the Allaire Collection. Description: A bottle of transparent pale green glass with a squat and almost cubic body, long cylindrical neck, as if sunken into sloping shoulder. Flaring mouth, rim folded outward and inward. Original plaster stopper. Flat base; two-ribbed strap handle applied to the shoulder, drawn up attached to middle of the neck at right angles and in a fold, going upward to edge of rim. No pontil. Remarks I: This square bottle is remarkable, not only because of its small height, but also because of the way in which the glass worker attached the handle, first to the middle of the neck as was common for glass production during the early first century, after that it looks like he suddenly realized there was a new and modified technique in attaching the handle to the rim, so his solution was to continue with the handle by making a fold and attaching the end of the glass coil to the edge of the rim, the new ”place to be”. Another rare phenomenon is the sealing of the mouth. Done by using a plaster stopper, originally to protect the liquid of which a rest, now as a dry substance, is still available into the bottle. To see another bottle in Hans’s collection sealed in this way click on this (active link) . Remarks II: On the top of every side of the body a slight circular impression can be seen which probably is the mark of the use of a hand-held tool, necessary to form and flatten the sides.